Lord Carloway – opposes judicial interests register. SCOTLAND’S newly appointed top judge – Lord President Lord Carloway - has attacked proposals before the Scottish Parliament calling for judges to be required to declare their financial interests and links to big business as called for in Petition PE1458: Register of Interests for members of Scotland's judiciary. However, Scotland’s latest top judge – on a salary of £220,655 a year - has declared his opposition to calls for a register of judges’ interests, with Lord Carloway claiming - the judiciary must remain exempt from the same transparency rules which apply to all other branches of Government, public bodies and the Scottish Parliament. Writing to Michael McMahon MSP, convener of the Scottish Parliament’s Public Petitions Committee, Lord Carloway said: “It is of great constitutional importance that the judiciary remain functionally distinct from both elected representatives, who make the law, and the Government, who promote changes to the law and take executive decisions in areas involving wide discretionary powers covering many areas of economic interest. And, the top judge – who recently published a speech on making Scotland’s courts 'fit for the 21st Century' – claimed justice could grind to a halt in a constitutional calamity if judges were forced to declare their vast wealth, property owning interests, professional links and other financial affairs – just like politicians, members of public bodies, local councillors are required to reveal. 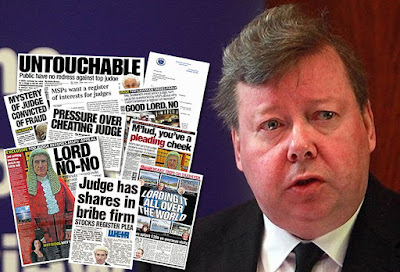 Lord Carloway added judges were unable to speak out in public or defend themselves against criticism – despite a series of recent headlines where judges have embarked on highly publicised criticisms of Police Scotland, the Crown Office, the media and other public bodies. The petitioner provided MSPs with examples of judicial public comments, stating: “On the same day the media reported that the Scottish Government announced a moratorium on Shale Gas Fracking, the previous Lord President Lord Gill spoke out, declaring "Our resources of energy may be increased by the retrieval of shale gas, if that should be allowed. It seems to me therefore that the opportunity that our natural resources present should be served by the court system." The petitioner concluded his response by asking members of the Public Petitions Committee to call the Lord President to give evidence and to contact Law Professor Alan Paterson of the University of Strathclyde – who has published a book and material on judicial interests. Letter from Lord Carloway to Michael McMahon MSP, Convener, Public Petitions Committee. 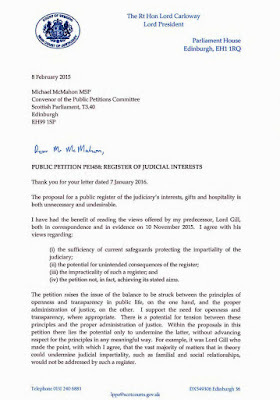 Lord Carloway: The proposal for a public register of the judiciary's interests, gifts and hospitality is both unnecessary and undesirable. (iv) the petition not, in fact, achieving its stated aims. The petition raises the issue of the balance to be struck between the principles of openness and transparency in public life, on the one hand, and the proper administration of justice, on the other. I support the need for openness and transparency, where appropriate. There is a potential for tension between these principles and the proper administration of justice. Within the proposals in this petition there lies the potential only to undermine the latter, without advancing respect for the principles in any meaningful way. For example, it was Lord Gill who made the point, with which I agree, that the vast majority of matters that in theory could undermine judicial impartiality, such as familial and social relationships, would not be addressed by such a register. The proper administration of justice could be inhibited by the disclosure of the judiciary's otherwise confidential financial arrangements. In that connection, there is the possibility that an individual judge may be the subject of misconceived criticism, deriving from the disclosure of personal financial information, where those interests are tangential and de minimis. It is inappropriate for judges to make public comment beyond their judicial opinions in relation to individual cases. Therefore, unlike an elected representative or a member of the Government, a judge enjoys no right of reply. Judges thus have no scope to remedy unjustified reputational and professional damage by explaining their decisions or responding to criticism. The appropriate safeguard with regard to the judiciary is not a register of interests, but the obligation to decline jurisdiction in a case ("recuse himself/herself") where he or she has any real or perceptible conflict of interest, whatever the nature of that conflict. In that regard, in the interests of openness and transparency, all instances of (and reasons for) recusals are published on the judiciary's website. It is of great constitutional importance that the judiciary remain functionally distinct from both elected representatives, who make the law, and the Government, who promote changes to the law and take executive decisions in areas involving wide discretionary powers covering many areas of economic interest. The danger that representatives and the Government could be influenced by personal interest is ameliorated by the relevant disclosure requirements incumbent upon them. The judiciary's function is not that of law-making nor is it equivalent to any kind of executive power. The same considerations do not apply. Lord Gill said that judges, "by their imaginative development of the law, [...] improve and extend the law, explaining it in their judgments". I echo this characterisation, but it is not reasonable to suggest that a judge, through the means Lord Gill explained, would be able to dispense jurisprudence over a period of time that would advantage a particular financial interest which he or she had. I hope that this assists the Committee. Amid calls for Lord Carloway to be called to give evidence and take questions on his opposition to judicial transparency, the Scottish Parliament’s Public Petitions Committee will consider the petition again next week, on Tuesday 23 February 2016. Scotland’s first Judicial Complaints Reviewer, Moi Ali, also backed the petition. During an evidence session held at Holyrood in September 2013 - Moi Ali provided a first hand, honest and highly detailed account of the workings of Scotland’s judiciary and lack of judicial transparency & accountability. Ms Ali wrote a further letter to MSPs while she held the post of Judicial Complaints Reviewer – writing of the “incredibly powerful” nature of the judiciary and why a register of judicial interests would help judicial transparency and public confidence in the justice system. Obvious lots to hide hence their fear. Make no mistake.This is fear.Fear of discovery. Not the tired old claim about keeping the judiciary independent or separate from government. NOT a surprise to put it bluntly - something very rotten going on here and everyone knows it! lol No Way! That one will stick! Carloway - “It is of great constitutional importance that the judiciary remain functionally distinct from both elected representatives, who make the law, and the Government, who promote changes to the law and take executive decisions in areas involving wide discretionary powers covering many areas of economic interest. Lord Gill said that judges, "by their imaginative development of the law, [...] improve and extend the law, explaining it in their judgments". Like handing a lifeline to murderers as the Supreme Court did last week.Improving the law right?No Way No Way. Dont trust anyone who does not practise transparency! It is of course no surprise that Lord Carloway wants all that a Register of Interests entails firmly swept under the carpet - 'Nikkla' and her SNP cronies would hardly have endorsed his appointment if this has not been so. However Lord Carloway fails to explain how a Register of Interests would prevent the judiciary remaining functionally distinct. Furthermore, far from inhibiting the proper administration of justice a Register of Interests would go a long way to ensuring it. Moreover, it would once and for all avoid any danger of an individual judge being the subject of misconceived criticism deriving from allegedly undisclosed personal financial information. Lord Carloway should also consider the wise words of Lord Irvine following the Pinochet case where he confirmed that a conflict of interest need not exist for a judge to be required to recuse themselves but rather the mere POTENTIAL for a conflict of interest arising was sufficient to demand recusal - so whether interests "are tangential and de minimis" is neither her nor there. Moi Ali, speaking from an informed and independent position, was absolutely correct when she wrote that the judiciary have a vested interest in this issue - something which has been made abundantly clear over the last 3 years of delaying tactics and obfuscation by the judiciary before the Scottish Parliament. Something up here and the judges are well at it.I bet there are a lot of dodgy goings and meetings before they decide what to do. How exactly can it be ‘justice could suffer’ if judges are forced to reveal secret wealth, tax, land ownership & financial links to big business? If justice suffers because a bunch of overpaid obviously RICH and FEARFUL OF BEING RUMBLED judges have to declare their interests then clearly justice is as corrupt as the criminals they make their money from in the first place. Is this how they keep rigging cases in the Court of Session? ?Keeping it all secret and under the table?? I am surprised anyone falls for the rubbish coming out of Scottish courts these days and the ridiculously edited opinions published on the judges website. All fixed for the highest bidder and a thick wad in the pocket of the judge on the day.No wonder they want to keep their ill gotten gains a secret. Top judge on £220K a year wants to keep judges wealth a secret .. umm could be a clue in the massive salary!!! I wonder what those lawyers and Scottish judges are thinking about Donald Trump now that the guy may be the next President of the US. Oh dear.Lord Carloway's fanboys wont like this one bit. MSPs have asked the Scottish government to consider a register of interests for judges to help guard against allegations of courtroom bias. Paul Wheelhouse, the new legal affairs minister, told Holyrood's public petitions committee that he recognised concern about a judiciary "shrouded in privacy" and said that he would seek assurances from Lord Gill, the lord justice general, that the voluntary system of declaring interests was "robust". Mr Wheelhouse said that he could not give a guarantee that judges had not presided over cases where they had an interest, nor could he give a guarantee that they would not do so in the future. Yet while he acknowledged that a financial register, similar to the system used in the US, might be worth examination, he said that it would have to include appropriate safeguards to protect judges from intimidation or "hostile and aggressive press action". MSPs from across the political spectrum said there was no strong argument against a judges' register when MSPs have to disclose their interests. The committee is considering a petition by Peter Cherbi, a campaigner who is calling for a register of pecuniary interests. Members said that the Scottish government could look to the US register and the former requirement for law lords to declare their interests to the House of Lords. Mr Wheelhouse said: "The situation in the US is that the assets, income and liabilities of judges, spouses and dependent children must all be disclosed, although information maybe redacted to protect an individual whose safety may be endangered." Kenny MacAskill, the former justice secretary, said that the US register had led to judicial candidates being "pilloried" and asked if judges would have to disclose their favourite football teams. Lord Gill has twice declined to give oral evidence to the committee, but has provided written submissions. His latest revealed a list of trials over the past year in which a judge or sheriff voluntarily stepped down or was asked to leave when a conflict of interest was disclosed. They included a sheriff whose membership of the Royal Society for the Protection of Birds was seen as an obstacle to presiding over a case involving the society, and another who was asked to leave a trial in which a report had been written by his colleague's wife. Anne McTaggart, a Labour MSP, said that she was "not fully convinced yet" that there was an argument for judges to withhold their interests when MSPs had to declare them. "The move by Scotland’s latest Lord President to undermine the Scottish Parliament’s efforts to increase judicial transparency follows a bitter three year campaign against the petition - led by Carloway’s former boss – Lord Brian Gill – which culminated in an ‘aggressive’ evidence session with the former top judge at Holyrood in November 2015." Good line.Hits it right on the head. So they rigged the case against Trump?Not surprised.Just goes to prove no matter how much money you have or power the judges and their legal fraternity win all round.A lesson in that for any idiot who still believes walking into a Scottish court gets you some justice.All it does is get you some corruption and a marked for life tag.Am I right? Taking three years to decide if judges should declare their interests or not just shows you how f* up society really is. Just think about it for a second - would No No Gill or No Way Carloway wait 3 years for someone to answer their question in court? No *** way is the answer to that one.They would be banged up until they spoke.Maybe a few jail cell beatings and waterboarding thrown in for good measure. I marvel at your blog! "Mr Wheelhouse said that he could not give a guarantee that judges had not presided over cases where they had an interest, nor could he give a guarantee that they would not do so in the future." There you have it first hand from a Scottish Minister.They cannot give a guarantee because they themselves suspect or are aware the judiciary are not declaring their interests properly. Reason enough to initiate your register of interests. I think if we knew what was going on we would expect our Judges would all be in prison, if the bent system prosecuted them? slightly lost by all this as I always thought judges declared their assets now reading that letter I see they are afraid to do so and we all know what that means dont we.Corruption and they are going to be found out! Sorry to hear you guys having so much trouble with these legal hoods hope u can make Scotland a better place one day!! I do not see any way round the fact the judiciary have taken such a poor attitude towards interests and the parliament they can no longer be trusted. And it took your petition to prove it. Why should judges be treated any differently.As you say in your own response LP Carloway arguments are no different from Gill.Turkeys do not vote for Christmas. They have been making Judicial decisions on the side those who line their bank balances for years. The courts are about serving the Judges financiers and throwing out cases which challenge those interests. They sit in the courts to augment their wealth while perverting justice because there is no one to hold them to account. This is why they want it all as it has been for centuries, secret. The so called independence of the Judiciary is a joke, the Judiciary and their secret financiers share mutual benefits and the cases are swung to serve those interests. Ha ha justice could suffer = I think Judges will suffer. Lord Carloway's constitutional calamity - refusing to declare judges interests and by reason the judiciary deign themselves above the law! It is always informative listening to others defending the indefensible. Lord Carloway trots out the same old, tired attempts at filibustering his predecessor was so fond of - all points which have been previously addressed and cogently dismissed in the parliament. Make the Register law - NOW! How come the letter from Carloway says 8 February 2015? Is he living in the past or did Lord Gill write the script for him? wow the judges must be more corrupt than I thought! I dont think so,Lord Carloway. Judges must learn to live with declaring their interests just like the petitioner and everyone else is saying. Well I am glad this judge is not hearing any case of mine.Imagine a judge writing a letter like that about transparency and then you expect them to sit down and hear claims depending on the same kinds of transparency!! The headlines alone cancel out any argument the judge can make to keep his/his colleagues affairs private. This is now about the judiciary being found out.Nothing more nothing less.Your parliament should act and bring in law requiring a register for the judiciary and then some. Wonder what stance the judges have on Europe? With all their shareholdings and stuff you published they must have a big vested interest in staying in.Will they come out and say it or do all the usual string pulling behind the scenes do you think? The Lord Justice General, Lord Carloway, has discussed the conduct of criminaltrials in cases involving allegations of a sexual nature. I can readily agree with many of his comments. Cross examination should have a clear objective, be focused and not simply a trawl back through all of the evidence. Of course, a witness should not be insulted or harassed and a judge is fully entitled to stop that happening. I support the proposal that a complainer has the right to be heard when the defence seeks her medical records; all well and good but there also seems to be an underlying suggestion that, nowadays, counsel regularly or generally cross exam in an inappropriate manner. That may happen on occasions but it most definitely is not the norm. Many lines of questioning must, in any event, be authorised in advance by the judge. Judges do not grant that permission easily and must be shown why that questioning is necessary and proportionate. Nor am I aware of any evidence that judges allow questions during a trial that are irrelevant and designed to upset and insult the witness. If, however, that is the case and judges are not doing their job properly then I assume Lord Carloway himself, pictured below, can deal with that issue. Defending and cross examining in such trials is not easy. The advocate is an officer of the court but is not an intermediary. His or her role in an adversarial system is to properly and robustly represent the interests of the accused and to do that fearlessly. That requires the advocate to conduct the trial without constantly looking over their shoulder and worrying about their own position I agree with Lord Carloway that the fear of having the advocate's own performance criticised in an Anderson appeal has not helped in that regard, although the remedy is to some extent in the Appeal Court's hands. (An Anderson appeal is when an accused person argues that he or she suffered from defective representation at their original trial.) What will only make the situation worse, however, is the added fear of judicial criticism. Senior judges are entitled to criticise poor advocacy but care needs to be taken that the fear of being so criticised does not result in, for example, crossexamination being conducted in a less robust and comprehensive manner that the legitimate interests of the accused demand. That is certainly not in the interests of justice. Advocates in these cases do a difficult and at times unpleasant job and, in my opinion, generally do it as it should be done. That should be recognised and encouraged. That is not to be in any way complacent. Maintaining the rule of law demands that every accused, no matter how unpopular, receives a fair trial but that in turn requires high quality, skilled and effective advocacy. Indeed, you cannot have the former without the latter. What an extraordinary attitude to judicial declarations and from the top judge himself. Clearly it is now required we need to know what exactly is being hidden. Carloway did himself no favours in his letter. Should you be calling him a top judge when he is so against transparency?How can he be a judge and be against such a register? I for one am horrified judges are so hostile to the idea of registering their interests.Until I saw your blog I always assumed a judge declared his or her interests.